December | 2010 | E-verything! The twelve days of a West Australian Christmas! A bronzewing in a gum tree. And a bronzewing in a gum tree. And a bronzewing in a gum tree..
All of the flora and fauna are found in Western Australia and are bound up the the culture and ecology of the state. So although I did this for fun it could be used in many educational contexts in Australia and globally. For example in my own current teaching context with literacy students I would use it as a challenge for them to find an image and write a little about one or more of the animals/plants – preferably choosing one where they had a personal experience to relate. In a previous teaching role in environmental science I could have used it to highlight adaptation of the flora and fauna to the West Australian environment. Increasingly as I continue as an educator it seems to me that almost anything I design or develop for whatever purpose can be used or adapted and used as a resource in myriad educational contexts. Thus my personal and professional “selves” are merging and perhaps giving an increased “richness”and depth to my work. Well voting time for Edublogs Awards is nearly up! 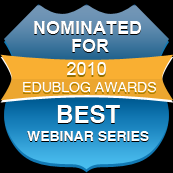 I have just felt so pleased and honoured that the Edublogs Live webinars were shortlisted in the “Best Educational Webinar Series” category. To check out the nominations and then perhaps vote for our Edublogs Live webinars then follow the link. Thank you so much to those who nominated and to those who may already have voted! We aim to be a friendly place for educators from around the globe to learn together; find out more about using the interactive potential of Elluminate; and have an opportunity to present a Fine Focus session. Once we had decided on the topic we started with a quick whiteboarding of what we understood it to mean. There was also audio and text chat discussion around this with a feeling that those of us present would start with a learning activity and then choose a tool to suit the activity rather than choose a tool and then make an activity that used it. We moved on to consider some activities and tools, again using the whiteboard. This time we split the board into two columns – we put activities on one side, tools on the other and linked them with lines. Of course many tools are usable for more than one kind of activity and vice versa so we ended up with a tangled web of lines – a great representation of the “real” world of Web2.0! We then moved on the a look at some of the Elluminate moderator tools giving people an opportunity to load presentations to the whiteboard and also taking a look at the potential of the multimedia library, and the possible pitfalls. Using videos has improved immensly since I first used Elluminate some years ago. The main issues are around file size and format – as is the case with any use of video in any online context. Whatever you use you need to remember that the participants need sufficient bandwidth and an appropriate player or the video won’t work for them! This session was fun! Every time we have Serendipity sessions that touch on Web2.0 toolsI meet new tools that I need to explore. Often I just dip in and may not actually take up the tool, but it gives me more potential “tools” in my “teacher toolbox” that I am aware of and that may one day be just the “right” tool for a particular student, group of students or topic. I also enjoy “playing” with Elluminate & love giving people moderator status so that they can investigate the extra tools available to moderators. Overview Edublogs webinar – Be the spider at the centre of YOUR web! As I write this post the shortlists for the Edublogs Awards have just become available so this means we can now vote. I was so excited and honoured to see that the Edublogs Live webinars have been shortlisted in the “Best Educational Webinar Series” category. If you want to check out the nominations and maybe vote for Edublogs Live webinars then follow the link. Thank you so much to those who nominated! This was a terrific Edublogs Fine Focus session (recording here). Sue Waters (@suewaters) the Edublogger joined us to share her ideas and strategies relating to one of the topics suggested on our Wallwisher. The topic was “How to manage using more than one Web 2.0 tool at once for education”. This was an active and engaging session from start to finish. Sue kept us busy with polls and whiteboards throughout. 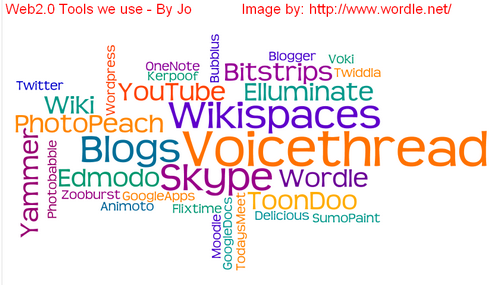 Sue began by asking us which tools we use – the resulting whiteboard was well filled and makes a great Wordle! Sue then placed the ball firmly in our court by asking what we wanted to know and then finding out about our own challenges, concerns and strategies that have worked. Next Sue moved on to talk about some general strategies for managing a mix of tools, again she invited whiteboard input from everyone. Then Sue shared some of the strategies used in (@tasteach) Sue Wyatt’s Student Blogging Challenge to manage the large number of participants and blog visits needed. Finally Sue shared some of the specific tools and strategies she uses for communicating and managing her huge daily inflow of information and some of those she uses for sharing and networking. Sue’s sessions are always full of activity with lots of whiteboarding and polling as well as text chat and audio contributions. If you missed the session it is well worth catching the recording for all the wonderful nuggets of information from Sue and also from everyone else. Our next Webinar is an Edublogs “Serendipity” session, one of our fortnightly unconference sessions where we invite you to bring along your “hot topics” and “burning issues” for our poll on the topic of the day. If you want to propose a topic in advance then visit the Serendipity Wallwisher and add your topic. Then join us on Thursday Dec 9th at 23:00 GMT/UTC (6pm USA EST, Midnight BST) or Friday Dec 10th at 1am CEST, 7am West Aus, 10am NSW, depending on your timezone – in the usual Elluminate room. Our last session this year on Thursday Dec 16th at 23:00 GMT/UTC (6pm USA EST, Midnight BST) or Friday Dec 17th at 1am CEST, 7am West Aus, 10am NSW, depending on your timezone – in the usual Elluminate room will be the usual End Of Year/Christmas Party. 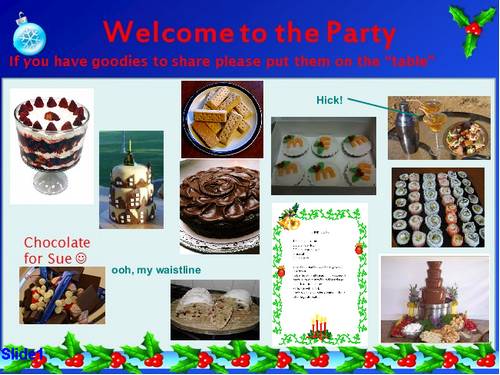 So bring along virtual goodies to share and please get your thinking caps on and devise an Elluminate Party Game for us to play. If you have an idea but aren’t sure how to make it work in Elluminate then put a comment on this post or catch me on Twitter (@JoHart).